Hon. 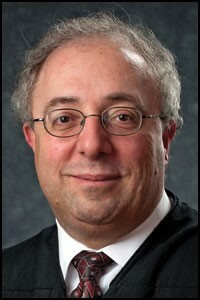 Joseph J. Farah practiced law for 18 years before being appointed to the Genesee County Circuit Court in 1998. He was originally assigned to the Family Division, handling domestic and juvenile cases until 2005, and is currently assigned to the Civil/Criminal Division. Along with being a member of the judiciary, Judge Farah has taught a dozen law school classes concerning the law of evidence and has been a regular presenter to lawyers and judges concerning evidence and many other topics in and outside of Michigan. He is a former board member of the Michigan Judges Association, the Michigan Board of Law Examiners, and other groups. When is your motion call? Are there a maximum number of motions heard during motion call? My civil motion call is at 10:00 a.m. every Monday. A limitation applies to summary dispositions (usually between 4:00 and 5:00 p.m.) but there is no limit on other motions. If the docket is full, civil motion call can go into the afternoon as well. The criminal docket begins on Mondays at 1:30 p.m., which includes criminal motions and other criminal proceedings. The driver’s license restoration docket begins at 4:00 p.m. on Mondays. Do you have any particular briefing requirements? What sort of arguments in a brief do you find compelling? My briefing requirements are per the court rules, but in general lawyers should do their best to express their positions as concisely as possible, explaining the precise issues and citing cases directly on point. I can tell when someone has submitted a canned brief; it usually has a great deal of information that is not on point and one or two small items that actually pertain to the matter. Don’t cite to multiple cases that say the same thing—it is not compelling. Don’t overstate a case or take it out of context as supporting your position when it doesn’t. It dilutes the impact of your brief and lessens your credibility. Also, don’t simply repeat what is in your motion and call it a brief. What do you think is the most commonly misinterpreted court rule or rule of evidence? I find that the most common rules of evidence that are misinterpreted are rules 801–806 on hearsay and 401–403 on relevance. Most lawyers will make an objection that something is not relevant or is hearsay, but then they don’t provide the analysis. Also, the concept of prejudice—not to your case, but to the ability to advance your case—is often misunderstood. Any other common mistakes lawyers make in your courtroom? Lawyers often assume that I haven’t read their brief. Because of this, attorneys will stick to their canned arguments and not listen to the questions I am asking. Not listening and not responding to my questions is problematic. Experienced lawyers know that my questions are foreshadowing how I am likely to rule, so a thoughtful answer to my question can make a difference in the outcome. Also, lawyers who are willing to concede a point and not argue every single issue have much more credibility with me. Who makes up your judicial staff, and what roles do they play? My law clerk helps me prepare for motion call, handles research and follows up with the lawyers on specific questions, and prepares rough drafts of opinions and orders. My secretary has been with me for 20 years and runs the office. My court clerk is the boss in the courtroom. Please treat her with respect. We also have a host of legal interns who read transcripts, do research, and prepare “write-ups” on each contested motion. The write-ups are the road map for each motion, summarizing the movant’s position and the respondent’s position, clarifying the issues, and then examining the evidence. The interns also look closely at the exhibits, so be sure your exhibits support the items you claim they do in your brief. But don’t be misled; I read it all, too. With civil trials, it depends on when was the case was filed. I do my best to have cases resolved within the two-year time frame. If it is close to the two years, attorneys should seek an adjournment via motion. When the case is not approaching a deadline, adjournments can be done by stipulation. If one side wants an adjournment but the other side doesn’t, a motion is required. What types of pretrial conferences do you hold, and what happens at them? Criminal pretrials are held Tuesday mornings. They number about 12 and we tend to focus on older cases. Usually 50 to 60 percent of these are resolved by plea during these conferences. Civil settlement conferences are held the day before trial. About 70 percent settle during these conferences. I provide my evaluation as a guide to settlement of the case. I require all persons who have authority to attend. When should my client come to court? Do you allow telephonic appearances? Other than pretrial conferences and other critical stages in which criminal defendants need to appear, I try to be flexible in my courtroom. I will allow telephonic appearances depending on the circumstances, especially when lawyers are from out of the area. As a general rule, I try to resolve issues without the need for people to make multiple in-person appearances. For instance, when there is an objection to a seven-day order, we simply review the arguments and my ruling to determine which order accurately reflects my rulings, and that order is signed. No need to come in. I will watch the DVD of the motion hearing. I am flexible with appearance times as well. For instance, if a lawyer cannot be there for the criminal docket at 1:30, I will try to schedule the case at a more convenient time as long as I am going to be on the bench anyway. How are trial dates scheduled? Trials are scheduled with the initial scheduling order. Same with criminal cases although sometimes those dates are adjusted from the bench. Do you have any advice for new lawyers? Yes. New lawyers should spend some time going to court just to watch what veteran lawyers do in the courtroom. They should take notes and write down the good and bad things lawyers did during their appearances. Lawyers learn from other lawyers and judges. New lawyers should ask the judge questions after spending a day in court about the rulings and the litigants. New lawyers should also go to as many ICLE seminars as their time and budget allows because you will always learn something. I have never gone to a seminar in which I haven’t learned something. Sit in the front row and pay attention. Finally, new criminal lawyers should pay attention while in the courtroom waiting for a matter to be called. Get off of your phones, quit messing around, and watch. Be in the moment in the courtroom. Make notes, study the law, talk to the judges. If you do these things, you will stand out. Young lawyers have a chance to shine. Knowing how to address the court is vital, so you need to be there and pay attention. Learn what to do and not do. When I am not on the bench, I travel extensively for both leisure and to teach evidence. I love horse racing and was there to see Justified win the Triple Crown. I am a big fan of football, music, and movies, too; I occasionally use phrases from songs and movies in court, albeit subtly.